Truth is often stranger than fiction. Fact. Imagine, if you can, a band being dismissed from their tour support slot for being 'too weird' by...Alice Cooper. Don't believe me? Then 1'11 let Big Country's frontman and singing guitarist, Stuart Adamson, take up the story himself. "We lasted only three gigs before they kicked us out. Mind you, we did play at full tilt all the time in those days and it must have been the most dense wall of sound anyone had ever heard, a mixture of punk rock with Celtic overtones and a bit of Scottish folk music with waltz time thrown in." All a far cry from the distinctive, guitar-led rock which would become B.C's trademark, but an appropriate amalgamation nevertheless, since in 1982 Adamson was fresh out of his former pastime, acclaimed punk outfit, The Skids - remember INTO THE VALLEY and WORKING FOR THE YANKEE DOLLAR? - while his beloved Scottish homeland, and recognition of it in song, would remain a prominent feature of Big Country's inspiration. They came together initially in Dunfermline, once Scotland's capital, when Stuart contacted a friend of long-standing, and fellow six-string player, Bruce Watson, and the pair began songwriting and rehearsing the results with the aid of a drum machine. The subsequent addition of a neighbourhood bassist, synthesizer player and human trap-rattler enabled early paying dates to be undertaken and thanks, largely perhaps, to Adamson's recent illustrious past, the prestigious Alice bookings and record company interest were swift in arriving. Mercury, however, were first to obtain signatures on the contractual dotted line, but indicated new accompanists to augment the Adamson/Watson partnership would be preferred. Fortuitously, two respected session men, billed collectively as 'Rhythm For Hire' though individually Tony Butler (Bass) and Mark Brzezicki (Drums/Percussion), who were booked to enable demo tapes to be made, enjoyed the work so much they were easily persuaded to stay. Big Country's classic line-up was thus in situ. 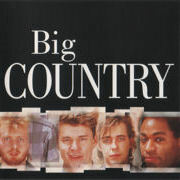 Big Country pounded tarmac extensively across the United Kingdom promoting their wares before joining producer Steve Lillywhite in May to cut a powerful opening album, THE CROSSING, set for July rush-release and prefaced in dealers' racks on 45 by an edit of another of its scheduled inclusions, IN A BIG COUNTRY. Result? A leap to No. 17 and, before year's end, the sight of that single providing a breakthrough elsewhere as Australia (5) and North America (17) were won-over. THE CROSSING itself sold prodigiously. 1.5 million copies were shipped worldwide and it registered on the best-sellers for a mammoth 80 weeks in Britain - peaking at 3 - 18 Stateside, during a fine 42 week residency, and 13 in the Netherlands, to mention but a few. Big Country had arrived big time. Thereafter, with only necessary pauses for breath, our four heroes wrote, recorded and toured to major acclaim throughout the remainder of the decade and into the Nineties, in the process unveiling such thought-provoking long-players as STEELTOWN (October '84), THE SEER (June '86), PEACE IN OUR TIME (September '88) and 1991's NO PLACE LIKE HOME. Singles were issued in abundance, including CHANCE (U.K.:9, 1983), WONDERLAND (U.K :8; U.S.:86) and WHERE THE ROSE IS SOWN (U.K.:29) - both 1984; LOOK AWAY (U.K.:7, 1986) and, from '88, KING OF EMOTION, which pulled up at 16 upon this sceptred isle. All those aforementioned gems and more are featured here, along with several numbers only previously available on long-deleted vinyl 12 inch singles. Band members themselves take the lion's share of responsibility for composing credits in various combinations, while admirable covers of the Equals' Eddy Grant-penned 1970 hit, BLACK SKIN BLUE EYED BOYS and, fittingly, an in-concert run at Smokey Robinson ft The Miracles' classic Motown weepie, THE TRACKS OF MY TEARS - a perennial live-set feature and Adamson favourite - make worthy companions. After almost ten years at the same address, Big Country left Mercury as 1991 ended, almost another regulation eighteen months elapsing thereafter before a new set of sketches, collectively THE BUFFALO SKINNERS, was released under another logo. In all that time only one change of face occurred, the new visage belonging to Simon Phillips, who was ultimately drafted in to replace the 1989-departed Mark Brzezicki. This compilation Ⓟ1997 PolyGram International Music B.V. ©1997 PolyGram International Music B.V.